Dodge Hits 2 Million Likes on Facebook! It appears that Dodge is quite popular on Facebook. So much so that it just made a rare number with how many people have liked it. Just yesterday, Dodge passed the 2 million likes. The growth has been fairly rapid too. It’s been over only the past year that the Facebook page of Dodge has doubled. Nearly a million likes in just that time frame. It’s hard not to see why people are flocking to the Dodge page to express their love for some of the best cars on the market. The Dodge Dart, for example, has really gotten fans and critics alike behind it. While the initial start of its sales may have been rocky, it’s clear that both the hype and word of mouth are starting to take effect with drivers. Then there was a good boost from its marketing campaigns this year. 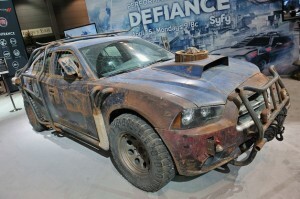 Dodge jumped into games and TV this year with the popular new sci-fi TV show and game Defiance by providing an awesome post-apocalyptic Charger. Also, having your vehicle line-up so focused upon in one of the biggest movies of the year doesn’t hurt. Fans love Fast and the Furious, and Dodge has always had a great relationship with the filmmakers. If you haven’t liked Dodge yet, head over to the Facebook page and join the swelling crowds. Don’t forget to like Bayside Chrysler Jeep Dodge’s Facebook page while you’re at it. We operate in the Queens area and offer top-quality customer service for those looking to drive away in a new or pre-owned vehicle. We love to say yes! There’s a new show about to air on Syfy that’s looking to be a fusion of media. It’s a TV show by the name of Defiance is about an alien war in a Mad Max-esque future. What makes this stand-out amongst other post-apocalyptic shows, such as Fallen Skyes, is that it will be released along with a video game. In the game, players will interact with scenarios from the show and may even have an impact on future episodes. While people, like me, are waiting to see if this is a feasible idea, it certainly seems like they have won over Dodge as a fan. At the Chicago Auto Show, Dodge showed off the perfect vehicle for the alien fighter. A Dodge Charger supped up to handle a dystopian future in its performance while certainly looking the part. If Mad Max is the look the show makers are looking to capture, then pop the champagne. The custom Charger that Dodge has given over to them is a beauty of desolation. Covered in grime and muck that show the future has lost the ability to produce competent car washes, the Dodge Charger in Defiance sure seems built to be punished. Window bars, a huge grille guard right out in front to deal with nasty creatures, and big ol’ truck tires to top off the rugged future look. The only thing missing from the car is someone in spike-covered leather with a Mohawk screaming while firing a gun in the air. The show premieres April 15th at 9:00 PM EST. You won’t be able to see this beast of a Charger in action until then, but at least you can stare at the pictures and imagine yourself running down aliens. For the present day Dodge buyer, if you’re in the Queens area, Bayside Chrysler Jeep Dodge is your one stop for all your needs. We have a full new and pre-owned line-up, which you can view online. Make sure you also like our Facebook page and follow us on Twitter for more news and monthly specials.